Two nuclear wars. Three asteroids. Demonic madness that kills one third of the world’s population. Into this, a savior will rise, cloned from Christ. It’s not fiction. It’s prophecy. It is the dawn of the New Age. After six millennia of stagnation, humanity stands on the brink of its final great evolutionary step. But it is a step that has come at tremendous cost. Half the world’s population is dead. The Pacific Ocean is barren. The forests of North and South America are a charred wasteland. Central America has been reduced to rubble. The planet’s survivors face a fundamental choice: follow Christopher Goodman, the Messiah of the New Age and clone of Jesus Christ, or cling to the very worldview and the God who has wrought this destruction. Under Christopher’s leadership the world begins to experience miraculous recovery, and soon the first signs of humankind’s evolution emerge, just as Christopher promised. His fanatical opponents, however, charge that he is the Antichrist, and that his name, when written in Hebrew has the numeric value of 666. Reluctantly, Christopher determines to use their own superstitions against these fanatics. He reminds the world that the prophecies of Revelation were written by the Apostle John, and it was John, who after using his dark powers to survive for 2000 years, is responsible for the near annihilation of the planet. It was John, whose writings in the Bible radically distort what is to come and who will emerge the victor. Each person must choose. All that’s certain is that the world is catapulting toward a final apocalyptic conflict, and humanity’s salvation or damnation depend on the true nature of the Christ Clone. Here it is, folks. 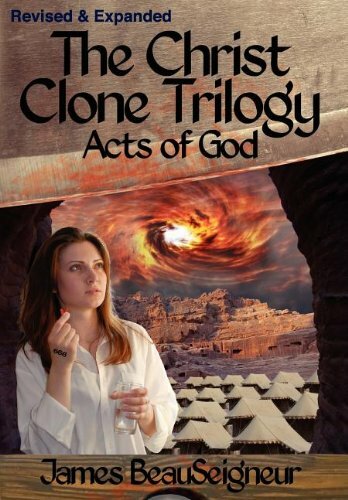 The thrilling finale to the Christ Clone Trilogy. I figured I’d get this review up on Easter, since it’s pretty appropriate, and so here I am. Whew, do we have a doozy of a review to get through. You might say that I prophesied that I’d get this review up on Easter. This kind of prophecy would be pretty well in keeping with the way this book handles the concept. I think I get ahead of myself. Decker Hawthorne is a guy from Knoxville. He makes friends with Christopher Goodman, who is the literal clone of Jesus Christ, the Nazarene, the Lamb, etc. As Christopher grows in power and takes over the United Nations and forms a one world government and ushers in the New Age, Decker follows him and writes some speeches and stuff. Lots of prophecies from the Bible start to come true. Christopher reveals himself to the world, tells people God is actually an evil alien who demands worship, and people start to follow him. And that’s about where we are. When we left off last time, Christopher had just been killed and resurrected. He squared off against a rabbi and the Apostle John at the site of the Third Temple and killed them. Then it started raining. I want to make it clear that I don’t really intend to criticize this book on any kind of theological grounds. That comes a little too close to rejecting the premise outright, and that’s not fair. I want to analyze this book for what it is and judge it on those grounds, not start railing against Christianity. I don’t think any of you want to read that, and moreover, if you do, there are much better writers than I from whom you can find that kind of thing. That’s gonna be hard at some places, and I think my own prejudices will become a bit clear. Sorry in advance. So how does this book stand up on its own? Is the writing any good? How’s the story? It’s got a lot of exposition dumps. A lot of scenes where people sit around and talk about things like salvation and the Antichrist and the End Times. It also has lots of bits when it breaks away from that to show us just how terrible things are in the world. There are plagues and all that kind of thing that are straight out of the Revelation of John. In fact, this book is basically a verse-by-verse retelling of the book of Revelation. It doesn’t hide that. In this “Revised and Expanded” version I got on the Kindle store, the author makes it very clear where his sources come from. Forty percent of this text is notes. Most of those notes are chapter and verse citations, mainly from Revelation, but the author also pulls in those prophets from the back-end of the Old Testament, too. My roommate is the one who pointed out to me that perhaps the point of this book was to turn Biblical Eschatology into a readable narrative. He didn’t put it into those words, but that was the gist of it. If that’s the case, I will say this book was a success! Despite flaws in storytelling and, um, getting to the point, this book was quite readable. Moreover, it pulled me in and kept me reading. I didn’t get bored reading this book, and it’s a vast understatement to say that I’m not its target audience. I wondered about the target audiences for the first two books, since they pulled in some wacky stuff. I no longer have to wonder. The whole point was to get people here, to the third book, where All is Revealed. The series stops being an interesting sci-fi religious thriller and straight up becomes a preacher in his pulpit ranting about how all of this will happen tomorrow. I mean that in a good way, if you can imagine it. Okay, so lots of things you might have heard about happen in this book. For starters, Christopher announces that his blood has healing powers. If people drink his blood, a process referred to as the Communion, they will live long lives and never get sick. Lots of people line up to do so. Keeping with some of the sci-fi theme, it’s not Christopher’s blood exactly, but rather blood that he’s been cloning. People get to take it in the form of a gelcap. It’s Decker, our pov character for most of the saga, who suggests that people who take the Communion ought to have some kind of Mark to show it. He suggests, somewhat facetiously, that the Mark ought to be a 666 on their foreheads. Everybody loves this and runs with it, although most people end up with the Mark on their hands. A thing that somewhat bugged me about the “prophecies” in this book is that not all of them were things that happen and we were warned about. Lots of the fulfilled prophecies were self-fulfilled. Take the Mark, for instance. Decker pitched it because, well, it’s in Revelation, isn’t it? Might as well run with it. Another one is that Revelation says that, at some point in this whole mess, the Euphrates River will dry up. It does, not because of some kind of supernatural something, but because Christopher ordered that it be dammed up. Why did he order that? To fulfill the prophecy! Other bits are a little more supernatural. Sores break out on everybody who has taken the Communion. The oceans turn to blood. The fresh water turns to blood. It gets real hot. Some kind of darkness-pain bubbles out from inside the Earth and consumes people. That last one makes for an interesting interpretation of Revelation 16:10. All of these disasters give Christopher more fuel in his war against Yahweh. Decker gets captured by some folks. Getting captured is what he does best. He’s taken to Petra, where some True Believers are holed up. Somebody mentions in dialogue that this is where Indiana Jones and the Last Crusade took place, and we are given a helpful footnote reminding us that that’s a movie. There’s a long discussion where some folks try to convince Decker that Christopher is actually evil and the Antichrist, which is interesting because Christopher already stated he’s the Antichrist, he just told everybody that that’s a good thing. Regardless, they manage to put the seed of doubt into his head and then set him free. Decker suffers through all the bits where the Seven Bowls are poured upon the Earth (Rev. 16) and then finally goes to face Christopher and demand the truth. And Christopher goes, “Yep!” and starts cackling real hard. And Christopher goes, “Because you were there!” and cackles a bit more. So everything’s lies and Christopher Goodman is actually Christopher Badman, except he doesn’t go by that, he instead states that he’s the demon Abaddon, and that everything is working out perfectly. Decker asks if all of the prophecies in Revelation are true. Christopher says yeah. Decker asks if that applies even to the part where the bad guys lose and get flung into a pit. Christopher says yeah. So Decker asks why Christopher is doing all of it in the first place if he knows he’s gonna lose. The answer is, basically, to annoy God, ’cause it’s fun. So here’s where I’m gonna get a little theological. Sorry. God planned this all out from the beginning. It’s His plan. This is all made very clear. So does it annoy God to…have His plans actually happen exactly the way He wanted them to? If Christopher/Abaddon is doing exactly what God planned all along, does he have any free will? I’d say no, it’s pretty clear he doesn’t. So is he a villain? Is he the antagonist? Or is he just working for the Eternal Protagonist behind the scenes, perhaps unknowingly? Why does that mean he gets to burn in Hell forever? This book features a God who, we now learn, isn’t evil after all and loves each and every one of us. Meanwhile, the book itself describes people dying in horrible, horrible ways. Babies, children, grandmas, young lovers, all violently smote in the name of making prophecy come true. I can pretty well see why Christopher’s whole thing caught on, is what I’m saying. Anyway, now that Decker knows the score, we get the best part of the book by far. They have this back and forth about how they’ll see each other in Hell. Decker says that he’ll be easy to find, because he’s the one guy down there praying to God for giving him exactly what he deserves. This upsets Christopher so much that he materializes a sword from thin air and uses it to chop Decker’s head clean off. The book makes a point to tell us just how long, it’s believed, a severed head can survive without the body. It’s just long enough to repent. The rest of the story is more chapter and verse description of the Apocalypse of John. Euphrates dries up, New Babylon is destroyed, people without the Mark are marginalized and eventually persecuted, and Christopher amasses an army to take out the True Believers at Megiddo. Looks like things are going badly for the Christians. Brief aside: All the true believers were Raptured in the first book. We’re told that. But apparently after the Rapture you can convert and you won’t get retroactively Raptured. Interesting. Of course, it’s at this point that The Man Comes Around. Yeah, it’s Him. He’s back. He’s pissed filled with love and compassion. He faces off against Christopher, who tries to tell Jesus to join him in his crusade against God. It goes about as well as you’d expect. Christopher and his chief crony, Milner, who it turns out is not really the prophet Elijah after all, get thrown into the Pit. Christ remakes the world, and Decker wakes up in it. He has a brief conversation with the Son of Man and then hangs out with his family for a while. His wife explains everything that’s happening, which she knows because she was a good Christian all along. Everything’s great and will remain so for a thousand years, when suddenly it will get greater again, although this timeline of Revelation I’m looking at points out that the Dragon is gonna rise up and do battle against God again before that happens. I feel like that was conveniently omitted. Guys, where were the Four Horsemen? Like, if you ask people the one thing they remember from the Book of Revelation, I think a lot of them will tell you the Four Horsemen of the Apocalypse. Those guys weren’t in this book. Sure, there was a lot of the stuff they represent, war and famine and pestilence and death, but the horsemen never show up. That represents one of the more mystifying things about this series for me. It goes back and forth between fulfilling prophecy in “normal” ways, like asteroids and nuclear war and dams and stuff, and totally supernatural things like blood oceans and darkness seeping out of the Earth. I wonder how the author decided which way to go with any particular verse. Sometimes he goes literal, other times suggesting that Revelation is couched in metaphor, or at least that John of Patmos perhaps saw some things he didn’t quite understand because it was like 80 AD at the time. I’d like to rant and rail against the long apologetic bits where Decker gets told about how everything the Old Testament said about the Messiah is true when you read the New Testament, but I think I’ll hold off on that. You can probably figure out for yourself why I find that argument bothersome, and this review is already going long. Ultimately, I think this was not a bad book at all. I obviously wasn’t who the author had in mind when he wrote it―or if he did, he was hoping I would be convinced by his suave arguments about grace, which didn’t work out―but in the end I rather enjoyed it. Of course, I’ve long been fascinated by eschatology and so forth, even though I don’t believe in it necessarily, so that’s probably why I found this series so enjoyable to read. I can’t imagine I represent the majority in that. The Book of R. is a twisted, mangled, unfathomable mess. This sounds worse. It also sounds like a worst case scenario of an author who couldn’t make up his mind. Or maybe a WCS of an unreliable narrator. I can’t imagine a Christian tolerating this story, nor an Atheist, and I can’t imagine anyone in-between caring. I prophesy that you may be, in fact, the one-man target audience. By the way, if you look in Backfile, Conversations in Bedlam, you’ll see my one-time take on the Antichrist as main character. Ooh, I’ll take a look ASAP!